after a couple of weeks of hammering away at a keyboard, my new website is finally on line. Why not check it out? If you have any feedback too, I'd love to hear it. I've written before about the tradition of the German travelling journeymen. One post is a more general overview and the other a more detailed look at some of the traditions that come with this life. Another post talks about what some of the geselle (German journeyman) traditions mean to me, as a settled craftsperson in Britain. Nat was the first person travelling in the tradition of the German guilds that I had met and talked to about it. Through him I also met several other people doing the same thing and I feel quite privileged to have had an opportunity to do so. Meeting journeymen travelling in the tradition is not that common an occurrence in Britain, even amongst craftspeople. Some of those that he put me in contact with I would now also call friends. The normal length of travelling is three years and a long day. The long day is the part that lets someone keep going if they don't feel that it's time to stop yet. During their travels, journeymen carry a map with a circle marking an area with a fifty kilometre radius and their hometown at the centre. They are not allowed to go into that area for the whole of their time travelling in the tradition (unless there is an emergency, such as a member of their immediate family becoming seriously ill). 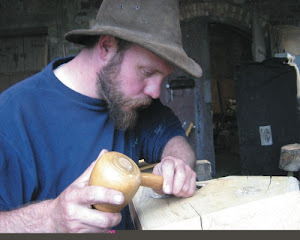 Nat himself is Danish and came into the tradition as a naver, which is the Danish equivalent of the German journeyman. Danish navers are not as frequently encountered as German gesellen and I was told that Nat was one of few Danish navers currently travelling at that point. He himself was travelling in the German tradition, having been introduced into the tradition by a German journeyman. After over five years, it was time for Nat to go home. Having been notified in advance of the day and location, Nat's friends and family were gathering next to a town sign on a busy road just outside of Copenhagen. The weather was bright with some cloud and the first chill of autumn on the breeze. As the journeymen would be hitchhiking to the spot, times were very approximate - he would be there some time after 3.30pm. I could feel the excitement build, with people crossing the highway to see as far as possible along it. It was great to have a chance to meet and chat with the others who were also waiting. Four journeymen arrived early, then headed back down the road to find the others so that they could all arrive together. Eventually, at about 5pm, a group of around twenty figures wearing the distinctive clothes and carrying the spiral Stenz sticks of the gesellen came into view. All of the friends and family gathered on the other side of the sign. As they got closer, the cluster of journeymen separated into a line and, walking in single file, the line snaked around and back on itself. It wound up alleyways and across the road, before finally gathering on an island in the middle of the carriageway. There, a few words were said between them, there was a cheer and Nat drained the last of a bottle. The group approached the other side of the sign from the waiting friends and family. Not all of the people in it were currently journeymen, some I knew had already finished their own travels but had put on their wandering clothes again for this day. They then formed two lines with their stenz sticks held between them. Nat climbed up onto this 'ladder' and clambered up to the sign. He then climbed back over, his journeying years done. I knew that in his pocket, in accordance with tradition, would be five euros: the same amount that he left with. There was still one more thing to do while we were there. When he left, Nat's friends and family had put letters for him into a bottle which was then sealed and buried at a certain depth five paces from the sign. Traditionally, Nat would dig the hole to bury it and his family would try to throw handfuls of earth back in to show that they didn't want him to go, while his journeymen friends defended the hole from being refilled. There were a few toots on car horns from passing motorists as the spade was brought out and Nat started to dig to retrieve the bottle, with some journeyman songs being sung at the same time. Eventually, other friends took over the work to give him a chance to talk to those who had come to see him. After a while, it was realised that the bottle wasn't there! The sign must have been moved in the meantime. So any rubbish was gathered up to be taken away and the hole was carefully refilled before everyone went off into Copenhagen to celebrate Nat's homecoming. The next day, there was another party, although everyone seemed a little more subdued after the drinking of the night before (together with the partying that had gone on before they arrived at the sign). 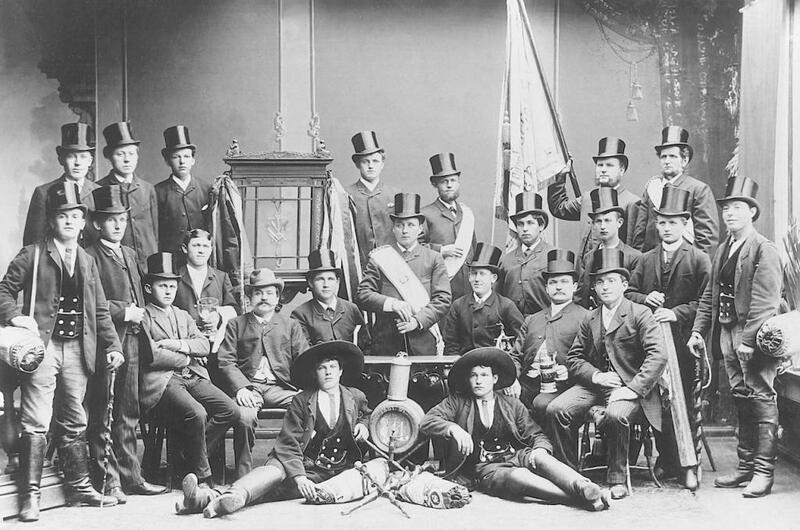 All of the journeymen got up on a stage in front of the family and friends and short speeches were made before some traditional travelling songs were sung. It was simple but also quite moving. Nat's family had brought clothes with them, which he changed into from his travelling clothes while the songs continued. Then there was a quiz. All of the stenz sticks were put into the middle and Nat had to guess whose stick each one was. Not easy with so many travelling companions there! It was great to catch up with old friends at the party, as well as meeting new ones. I hope that these posts allow English-speaking people who haven't met journeymen travelling in the German tradition to learn a bit more about it. It would be good to think that they might open a few extra doors to those travelling in the UK and elsewhere, where the traditions are less well known and understood than in continental Europe. And, of course, good luck to Nat for his next adventures! Passau is a city in Bavaria, in the south-east of Germany. It is not far from the borders with Austria and the Czech Republic. The city has a long history and it stands on the strategically important junction between three large rivers: the Donau (known in many countries as the Danube), the Inn and the Ilz. These rivers join at a point called the drei flüsse eck (three rivers corner) at the end of the promontory on which the old town stands. From there, the river becomes the Donau (Danube). The town is first mentioned in Roman times and was the residence of a bishop from 739 CE. Bishops became the rulers of the small independent city state of Passau in the 13th century. The town was devastated by fire in 1662 and was rebuilt shortly after, using designs by Italian masters, in the baroque style. Passau became part of Bavaria in 1803 and the baroque had a big influence on Bavarian architecture, even through to the nineteenth century palaces of King Ludwig II. The most impressive example of this baroque architecture in Passau has to be the Cathedral of St Stephen, in the centre of the old town and surrounded by cobbled alleyways and courtyards. It was designed by Carlo Lurago, with stucco work by Giovanni Battista Carlone and frescos by Carpoforo Tencalla. The overall effect can be seen in the first image above and in these below: the floor and lower parts of the pillars of the nave are fairly sedate, rising overhead to a tumult of colour and form. The cathedral also houses the Europe's largest cathedral organ. Even though most of the decorative sculpture is made from stucco (which is a mixture of lime, sand, water and sometimes a binding agent such as horsehair) there is some carving in wood. The organ has carved and gilded decoration and there is a large crucifix and some smaller statues. This cathedral replaced an earlier, medieval, one which was destroyed in the fire of 1662. Now, one of the few remaining identifiable pieces of the original cathedral is a carving that has become a symbol of the town and is displayed nearby - a large face carved in stone and now known as 'Der Passauer Tölpell'. As well as the incredible work in the Dom, more beautifully-made pieces could be seen in many of the streets and alleyways around the old town. Some were statues..
...but more impressive to me were the stunning doors leading into many of the houses and courtyards. I wonder if these also date to the mid-late seventeenth century?